Take a bowl. Add besan, rava, salt, red chilly powder, turmeric powder, cooking soda, curd and mix it well. Add capsicum, carrot, cabbage and mix it well to make a thick batter. If it is too thick add some water. The batter should be thick but pouring consistency. Take a bowl and mix mustard seeds, cumin seeds and sesame seeds. Take a tawa/griddle and heat it. Add 1 teaspoon of oil and put about 1/4 teaspoon of seeds mix in the oil and let it crackle. Pour a big ladleful of batter on it and spread it evenly to make a pancake. After a minute turn the gas on medium heat. When one side is done light brown, turn it on the other side with a spatula and cook it till it is done on both the sides. 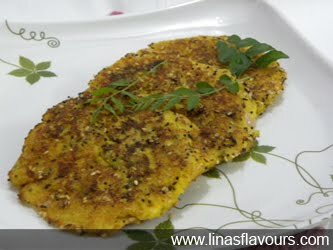 Serve it immediately with tomato ketchup or green chutney.